A practical example of converting a text based slide on impact of social media into a visual presentation using a simple powerful diagram. In this series, we will take up text based slides and covert them into visual diagrams. 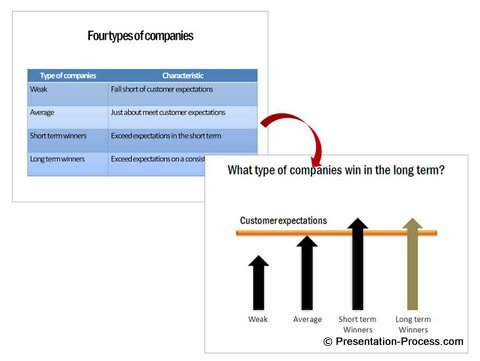 From the before and after examples, you can see the power and impact of using visual diagrams in business presentations. Please do read through it, as we will be using the information presented here through the rest of this article. There are too many words on the slide which may put off the audience. The audience can read the words themselves and don’t need to listen to the presenter. There is no visual representation of the idea, which makes it difficult for the audience to understand and retain the message. 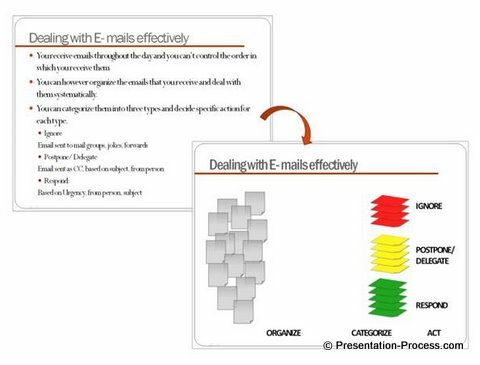 Though the icons used in the slide are appropriate, they don’t add any value to the audience because of the way they are used. Let us proceed with the makeover. The core words that need to be represented on the slide are highlighted above. The rest can go into the speaker notes. The impact of the second level spread. Let us convey the concept using a simple diagram and represent the relationship better using custom animation. 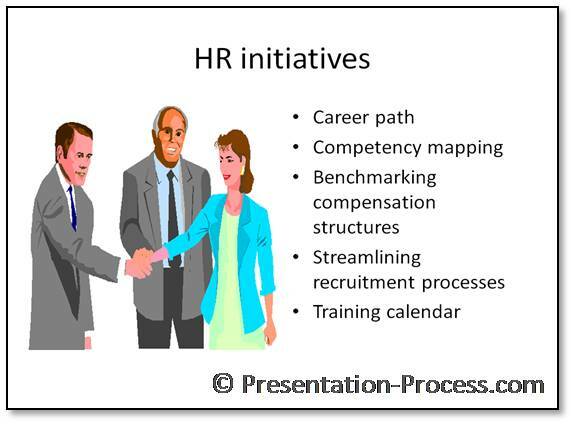 Please click the play button below to view the animated visual presentation slide. There are two types of information transfer. 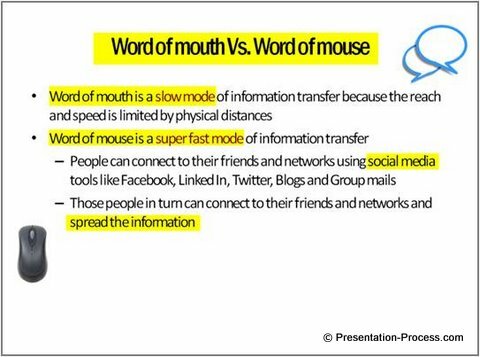 They are Word of mouth, which is about people talking to each other to spread information and Word of Mouse, which is about using Social Media network on the internet to spread the message. First let’s talk about Word of Mouth. 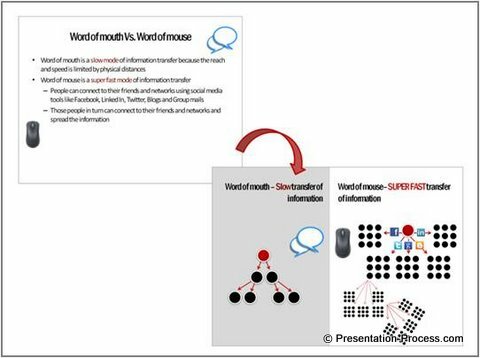 Word of mouth is a slow medium for information transfer. The reason is – (CL) the speed and reach of information is limited by physical distances for most times. On the other hand, Word of Mouse is a SUPER FAST way to transfer information. It’s because– people use social media networks like Facebook, Twitter, Linked In, Blogs and Group Mail to spread the message. There are no limitations in terms of physical distances. So, the spread and reach is more. The momentum grows even further when the recipients spread the message to their networks in turn. 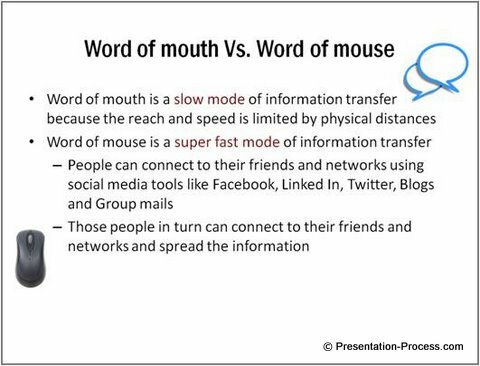 So, when you want to market your product, focus on Word of Mouse as much as you focus on Word of Mouth. As you can see, the same information is presented with utmost clarity when it is presented visually. We showed the difference in speed of the two media using custom animation. See the difference in the look and feel here. The process of visualization is quite easy to learn. 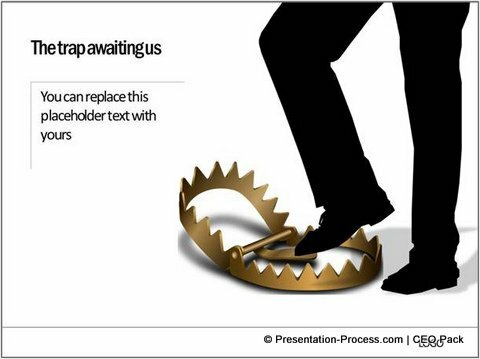 If you want to learn our proprietary process and convert your text based slides into simple and powerful diagrams, you can look at the Visual Presentations eBook here.